In January, I posted this blog about education spending and results in Georgia. In May, the US Census office released updated per pupil spending numbers. I have updated my regional map with these numbers, along with Georgia’s tax climate ranking, poverty ranking and the percentage of students receiving free/reduced lunch. 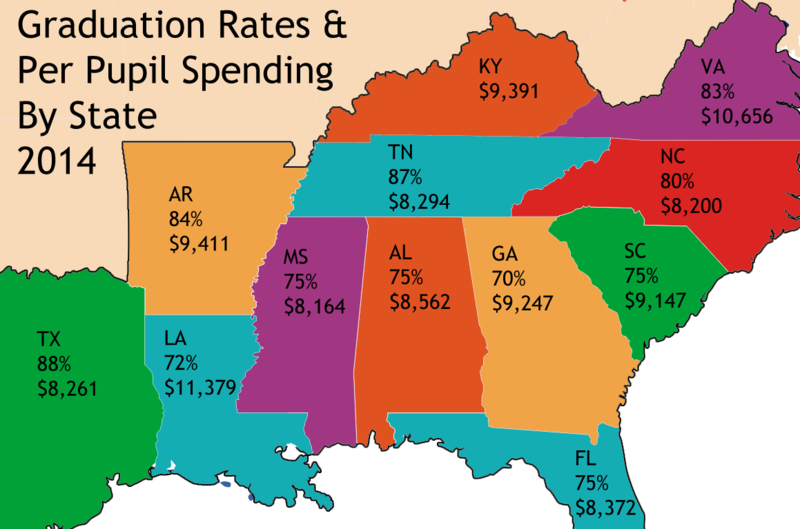 Georgia is still spending more per pupil and has a lower gradation rate than all of our border states. Texas, Tennessee and Mississippi all spend less per pupil, have higher graduation rates, better tax climate rankings and more poverty than Georgia. South Carolina and North Carolina both spend less, have higher graduation rates, similar poverty rankings but are rated below Georgia in tax climate. But look for both South and North Carolina to improve their tax climate rankings. North Carolina passed a major tax reform bill this year. South Carolina is working on a major overhaul. What is Grover Norquist Referring To? 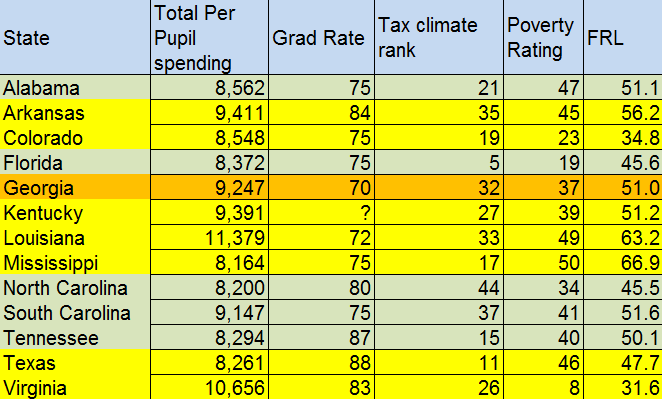 Local Boards of Education are required to publish tax and expenditure data. See https://ted.cviog.uga.edu/ted/Default.do . Don’t know what Grover Norquist is referring to, but it appears [you are] campaigning on something that is already there. I am advocating for adopting a system of financial integrity indicators that are rated and disclosed via a report generated by the State DOE. I would like to see us adopt a system similar to the Financial Integrity Reporting System of Texas (FIRST). This system collects data on 20 indicators of fiscal health for each district in Texas (they have over 1000). Each indicator is scored and a composite FIRST rating is then given to the district. Districts are required to hold a public meeting to discuss and disclosure their FIRST rating. Furthermore, Texas has a list of consequences for districts with poor performance records, including poor fiscal management. We have nothing like this in the state of Georgia. The purpose of the financial accountability rating system (Texas Administrative Code (TAC), Title 19, § 109.1001) is to ensure that school districts and open-enrollment charter schools are held accountable for the quality of their financial management practices and achieve improved performance in the management of their financial resources. The system is designed to encourage Texas public schools to manage their financial resources better in order to provide the maximum allocation possible for direct instructional purposes. The system will also disclose the quality of local management and decision-making processes that impact the allocation of financial resources in Texas public schools. I also advocate for on-line check registers. Most districts in Texas now have these so that taxpayers can see timely data for each financial transaction. They can find this information easily on the district’s website. There is no need to hunt for data or only have access to old information. The Cato Institute released a report titled “Cracking the Books” in which Georgia received an F for reporting of educational expenditures. I agree that we need to improve our financial reporting and disclosure for our educational tax dollars. School districts are not even required to hold a public review of their proposed budget. (If there is a change to the millage rate they must hold meetings about that.) This year HB 886 was introduced to require school districts to hold 2 public meetings prior to passing the budget, requires the budget be placed online, and requires that a line item budget be made available upon request at no charge. Another missing aspect in Georgia’s stewardship of the public’s money is that we do not determine the efficacy of each dollar spent. Other states are performing studies where they are “studying the intersection of academic progress and spending for efficiencies in public education.” Georgia should be doing this as well. The Georgia DOE website does not offer an intuitive and helpful system of data that can combine relevant and timely information on the finances of each district. Georgia’s citizens should be able to access a report that not only has financial data but also the correlating achievement and staffing data. This will allow Georgia’s citizens to see the results they are getting for the dollars they are spending. The bottom line is that HOW we spend the taxpayers’ money will drive results. We are not even measuring this. We make getting information difficult and often provide old data. We must do better. Follow the money. That phrase was popularized during the Watergate tumult. It is also a wise directive for all taxpayers in our state and beyond when it comes to how we spend your tax dollars on education. So, what happens when you can’t “follow the money” because the government and the Iron Triangle Education Bureaucracy puts obstacles in your way? The Cato Institute has released a study about the transparency in spending by departments of education. It turns out Georgia earned an “F”. Click here to see their study. About Georgia, Cato points out, “Georgia is missing the most recent year of expenditures and fails to provide a table or graph that would allow citizens to easily compare changes in spending over time.” In fact, Georgia is missing the most recent 2 years. The financial data that is provided through the state DOE website is the 2010-2011 school year – a full 2 years behind our current fiscal year. (School districts have fiscal years that run from July 1 through June 30. The fiscal year is referenced by the year in which it ends.) So we are missing FY12 and FY13 on the fiscal reports. Until we fix the financial issues that plague Georgia’s educational spending, we won’t fix education in our state. Unfortunately, Georgia’s Department of Education has not held districts accountable for how they spend your tax dollars. It appears the DOE’s only retort is to ask for more of your money. Our DOE continues to send hundreds of millions of your dollars to districts that do little to improve the educational lives of our children or even provide transparency in their expenditures. It’s all a bit cozy. Sadly, administrators have grown their take of your money over time and let smaller amounts accrue to the teachers in the classroom. Dr. Scafidi’s study, The School Staffing Surge, on how administrative staffing has grown over time in excess of student growth. In an upcoming “Coffee Talk”, we’ll cover the finances of education in Georgia and how they have hurt taxpayers, students and teachers all while benefiting the educational bureaucrats. Follow the money, indeed.